Forming a Limited Liability Company? Do you need an LLC operating agreement for a new limited liability company? While you might be tempted to skip drafting an operating agreement, you shouldn’t. The LLC’s operating agreement is important. The document describes how the owners administer the limited liability company. An operating agreement increases legal liability protection because the document further separates the identity of the limited liability company from the identities of the LLC’s owners. Finally, outside parties like your bank usually require you to provide a copy of your operating agreement before they’ll do business with you. For $14.95 you can purchase a multiple member limited liability company operating agreement. The agreement, which you download at the time of purchase from the last page of the ordering form, is a two-page, rich-text-format file created in Microsoft Word. The short document shows you what a multiple member limited liability company operating agreement looks like. You can even use the LLC operating agreement as a template for constructing your own personalized limited liability company operating agreements. Simply fill in the blanks and make whatever other changes you want or your attorney recommends! 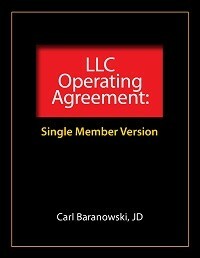 Alternatively, you can also purchase a single member LLC operating agreement for $14.95. The single member agreement, which again you download at the time of purchase from the last page of the ordering form, is a rich-text-format file created in Microsoft Word. The short, two-page document shows you what a single-member operating agreement looks like. As with the multiple member version of the document, you can use the limited liability company operating agreement as a template for constructing your own personalized LLC operating agreements. The sample operating agreements available here were written by attorney Carl Baranowski. An attorney for more than twenty years, Carl Baranowski has worked both as an in-house corporate counsel and as a practicing attorney, serving both private and public real estate and high technology companies. Baranowski holds an MBA from Stanford University’s Graduate Business School and JD from Stanford University’s Law School. He also earned two master’s degrees and a bachelor’s degree from the Massachusetts Institute of Technology. A member of both the Florida Bar and the Texas Bar, as well as a past member of several other state bar associations, he also co-authored the popular legal reference, Representing High-Tech Companies (Law Journal Press, 2006).